Today I would like to introduce you to Thai food, Yam Wun Sen!!! 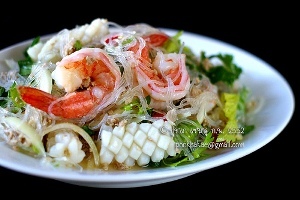 This salad commonly includes minced pork, prawns and/or squid. You can add lime juice, fish sauce, sugar and fresh chilies. The flavors chosen for this salad can vary depending on personal perference. Some may like it sour, some may not. Some would perfer spicy and salty, but less sour. The freshness of cilantro adds a touch of herbal aroma that goes perfectly with the other ingredients. For those who like mushrooms, the wood ear mushroom is often a preferred choice. Hope this Thai food is interesting for you!